Technically we all have to grow up, but that doesn’t mean we can’t always be kids at heart. 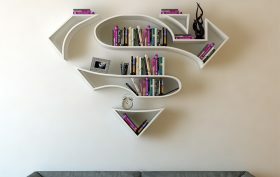 Turkish product designer Burak Doğan helps us integrate this sense of play into our often serious adult lives with his series of superhero bookshelves. Now you can transform your dull living room into your very own superhero lair.